Is there really a way to find instant happiness, here and now? Can one be truly happy regardless of one’s circumstances? Is there a path to happiness that can work for literally everyone? The author of The Warrior’s Mirror and many other bestselling books published in ten languages addresses these questions and many more in his new book, Secret of Happiness. A master of modern, practical spirituality, Sirshree lays out the Seven Levels of Happiness available to human beings in this approachable little book. From the first level (consisting of little more than fleeting pleasures) to the seventh (a transcendent happiness); simple, easy-to-understand explanations guide the seeker toward ever-increasing vistas of joy. In Secret of Happiness, Sirshree opens a pathway to the lasting happiness that we all seek, but which so often eludes us. He assures his readers that instant happiness is not a pipedream; it is within the reach of everyone. Happiness, he writes, is actually our natural state, our true nature. Layer upon layer of delusion has formed in our minds, keeping that which we naturally seek always just out of reach. The trick is to begin a shift to a higher level of consciousness. This book reveals the secret that we already know intuitively, but have forgotten through self-delusion, wrong conditioning, and a lifetime of internalized negative messages. 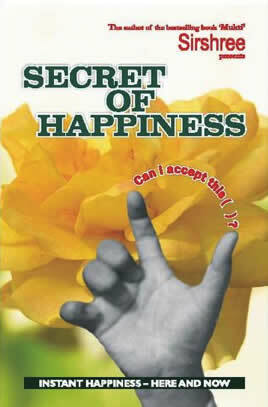 Central to Sirshree’s message throughout the book is the question, “Can I accept this?” He explains that acceptance of reality as it actually is (rather than how our minds perceive it) is at the heart of living a consistently happy life. The mere fulfillment of desire is not real happiness: everyone has had the experience of wanting something very badly, certain that it is the key to their happiness; only to find that, once apprehended, the object of their desire registers internally as a “Big Zero.“ Unfortunately, such is our nature that we typically simply replace the desired object with something else and repeat the process, with (predictably) disappointing results. Secret of Happiness teaches us to get off that particularly unpleasant treadmill. Sirshree also speaks to the concept of “causeless happiness”—being happy for no particular reason at all. If asked, “What are you so happy about?” the spiritual adept could probably only respond, “I am happy because I am happy.” This might leave the questioner feeling as if she were being toyed with; in fact, she would be receiving a great gift— if she could only shake off a lifetime’s worth of delusion in that moment. There is a particularly helpful chapter on things that rob us of natural happiness, called Dacoits of Happiness. (A dacoit is a thief or bandit.) Sirshree also offers three distinct steps to gain the sort of lasting happiness he is writing about. The book closes with practical steps for accepting whatever circumstances one finds oneself in. The Appendix includes useful information on the Tejgyan (“Bright Truth”) system of wisdom, and Sirshree’s Global Tej Gyan Foundation.